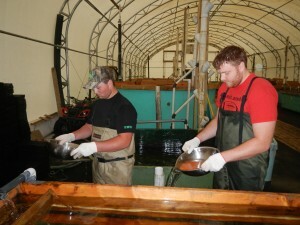 Each year the Miramichi Salmon Association gathers wild adult salmon for spawning at the Miramichi Salmon Conservation Centre. 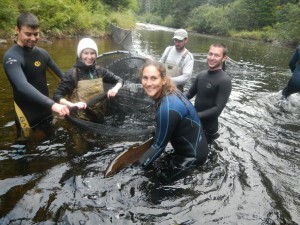 This is a great opportunity to volunteer in a fun activity to help the MSA gather these fish. The Miramichi Salmon Association works closely with government and non-government organizations to help keep the Miramichi River stocked with Atlantic salmon. 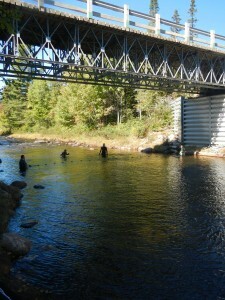 JD Irving recently posted a video to YouTube discussing the broodstock collection and subsequent stocking of salmon fry at Burnt Hill Brook on the Southwest Miramichi River. MSA President Mark Hambrook describes the broodstock collection process and you can watch our staff at work. The process involves surrounding a pool with a fine mesh net with weights on the bottom of the net to keep it along the gravel and floats on the top of the net to keep it at the surface to form a barrier to the salmon. The seine net is slowly drawn into one shore and the area that the fish can swim in becomes smaller until the area is small enough that we can reach in and pick the salmon up. The salmon are then placed in a special vessel with water and carried to the tank truck and placed in the tank supplied with oxygen. 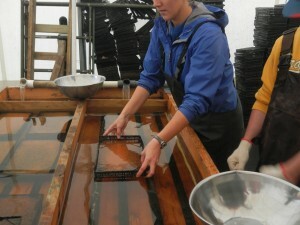 Once the appropriate number of salmon are collected , the balance of the salmon are released and the tank truck takes the captured salmon to holding tanks at the hatchery where they are held until spawning time, usually mid-October. Once spawned, the salmon are released back to the wild. The volunteers will need chest waders to be able to get in the water to help guide the net into shore and can help carry the fish to the tank truck. We don't mind if we have too many people, because it is fun just to watch the process and we can find something for people to do. The proposed schedule is dependent on weather and can change, but we will update the website with any changes so people can plan accordingly. Please contact MSA Biologist Kelsey McGee at (506) 622-4000 or by email if you are planning to join us for one or more outings. Once we know you are interested in coming, we can notify you of any changes. We sometimes have space in our trucks for volunteers or you can take your vehicle and we can rendezvous with you at the pool or at a convenient location along the way. Thank you to all the volunteers who helped in 2017! We hope to see you again next year! The females are placed in an anesthetic bath for a few minutes to calm them down before they are stripped of their eggs (orange eggs in the bowl). When the fish is empty she is immediately released into the brook. Sperm from a male is then added to the eggs and he is also released. Water is then added to the bowl to activate the sperm and begin the fertilization process. The window for fertilization is very small (minutes) once the water has been added. Not only does the water activate the sperm to fertilize the eggs, it also causes the eggs to swell and close up. 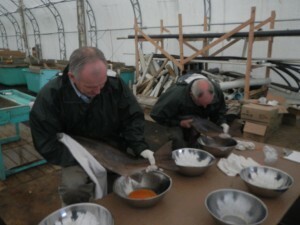 The eggs are rinsed several times in the bowls to clear off any biological tissue. Once the eggs have been rinsed clean they are transferred to egg pans/trays (black wire) and left to water harden for 4 hours. At this point the eggs are placed in a disinfectant bath and moved to our egg room where they are separated by stock in long troughs. The eggs will remain here over the winter until they hatch in the spring, after which the fry will be stocked back into their natal streams. We would like to thank Morris Wholesale Ltd. for their support in this project by providing bags of salt to make salt baths for the fish.